For my 7/8th indoor layout I decided to go with modified Maerklin gauge 1, code200 track. Here is my first switch, build from an old Märklin standard switch with 1020mm radius. I straightened the curved part after the frog and so got an about 15degree switch angle. 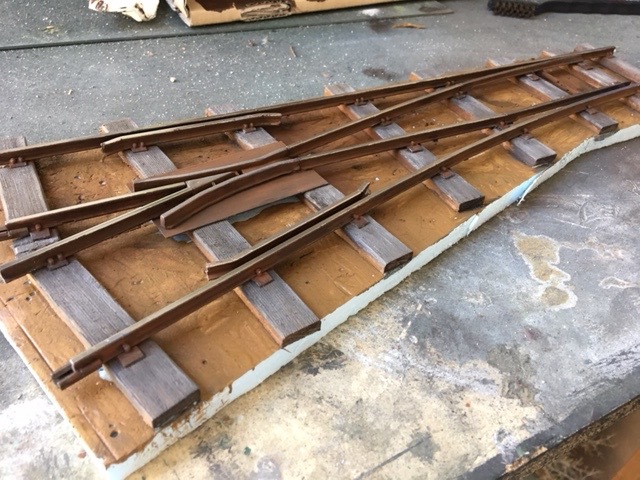 I cut off the plastic sleepers and nailed the rail down to 1,5 cm wooden sleepers. Also I used some Ozark rail plates that I had in the rail building box. They are G-scale but I think it looks ok. Some screw imitations are missing on the frog plate. The new 7/8ths switch looks pretty cool ! What size cross-section are the wooden ties ? & how long is the switch, from end to end ? Length of the switch is about 395mm. "1:22,5 scale on 32mm track"
version of Toeffelholm, many years ago. Did you do any outdoors running over the summer ? well, things are going on very slowly. To much occupied by this real life money earning thing. 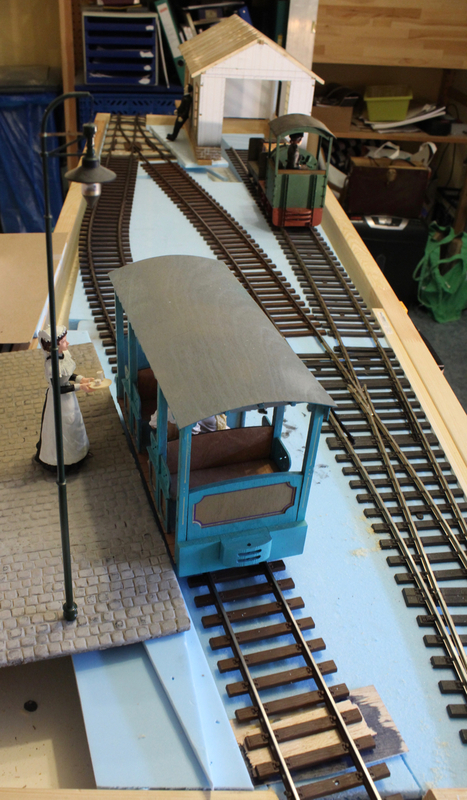 Still planning on a little shunting layout, but I managed to make up a first test setting. There will be a turntable for a train in the hidden part on the left. 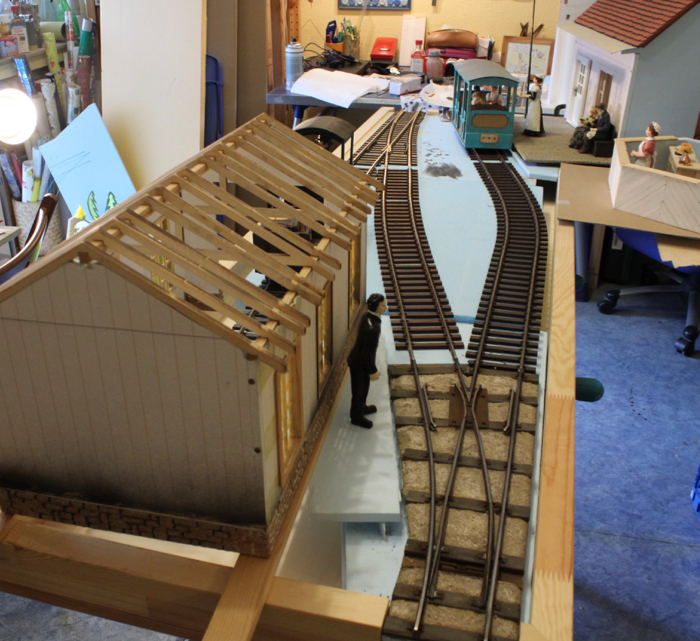 The building on the right (ex G-scale loco shed) will be the entrance of a bigger warehouse in the off on the right. There will be a traverser for small freight cars, so that you can bring loaded cars in and empty out or vice versa. 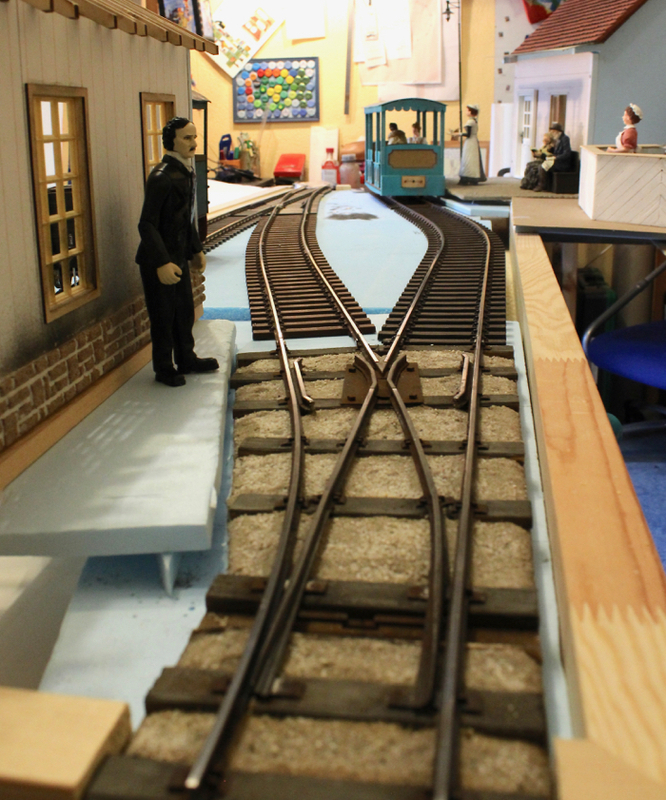 The station building will be a Peter Barnfield inspired building. 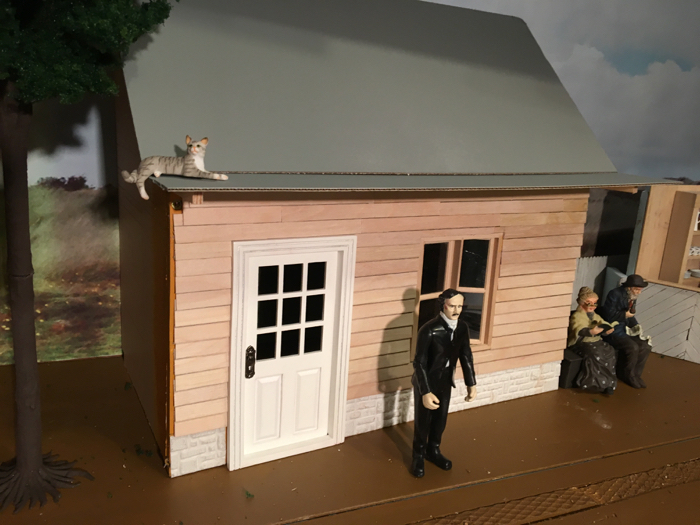 Gets a corrugated roof instead of the one I placed for the photo. A speciality of the this railway, that serves as a sea side tourist line as well, is a coffee and cake serving "to go". Well, I dunno about s l o w l e y . . .
You seem to have done LOADS if you ask me ! I haven't seen the coach, having the cake delivered to the ladies before. Your figure collection seems to have grown as well, and they look great ! Plus buildings & more track as well. The open car is a Bagnall car from 1884, made for an exhibition in Kalkutta. Ferd Mels once created and offered those kits, but they are no longer available. I had the opportunity to get his first built and painted car from him. I also have a kit of a second one, but it still isn't built. Figures are very important to me, as you can't tell a story without characters. I'm very glad that I recently had the opportunity to get some of the wonderful Figures Carlo Spirito once made for 7/8th scale. Wills show them in the Figures section when I have them in paint. Wonderful and really inspiring for a beginner like me. Oh yes, Theodor. I haven't seen him for some time, but I think we need to have a closer look to the cake table at Rosalie's coffee stall. Ah ! ... Theodor is BACK !! Double the size ! & double the trouble !! 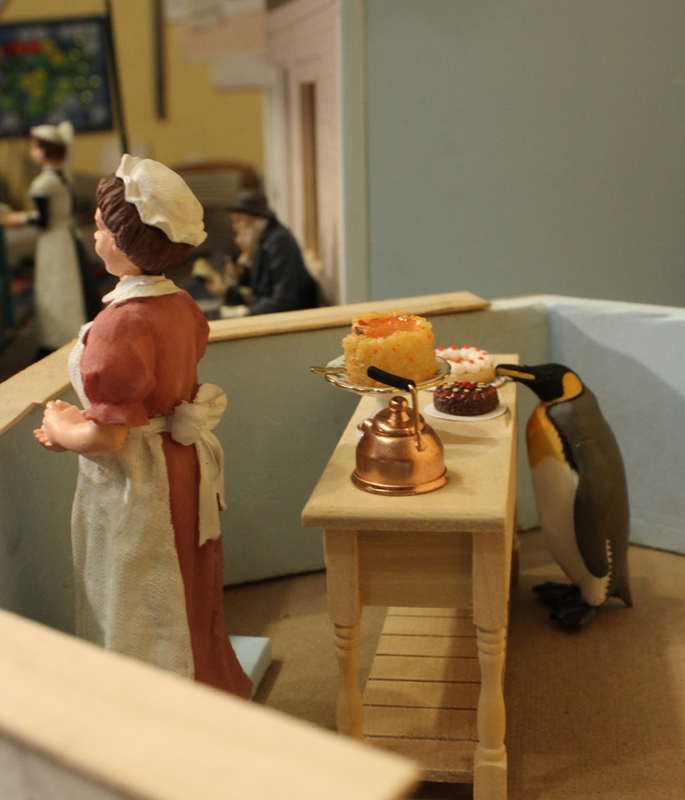 The cake stall lady is about to get a beak in her baking. I think Theodor is deciding between chocolate & cream-cake !! Is this to represent a tin roof, and a hot one? that's only a basic cardboard covering at the moment. 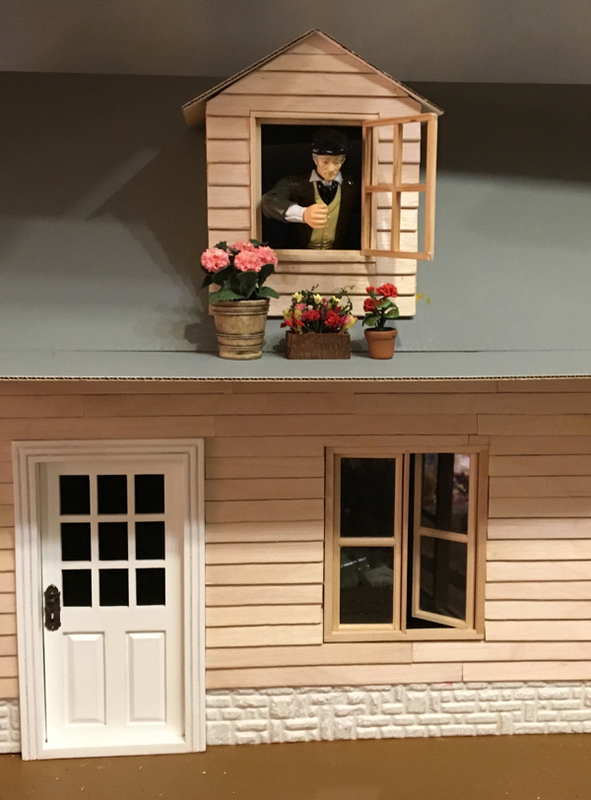 The building will get a corrugated iron roof, according to a station Peter Barnfield created in one of his pictures. All the shock & fervour of Tennessee Williams AND ... Toeffelholm ? ! Could be a scorchingly outspoken railroad ! Is that Elizabeth Taylor working at the cake stand ? It might be a long hot summer . . .
Si, my layout takes place in the late 20's. ...unless she was a time Traveller. Si. wrote: All the shock & fervour of Tennessee Williams AND ... Toeffelholm ? ! Ah, now I understand what you talking about. But concerning Tennessee Williams characters, I would have to put the Cake Lady onto the roof. I think she will preferably go under the roof and visit Mr. Wagner. Seem's to be a time traveller as well. 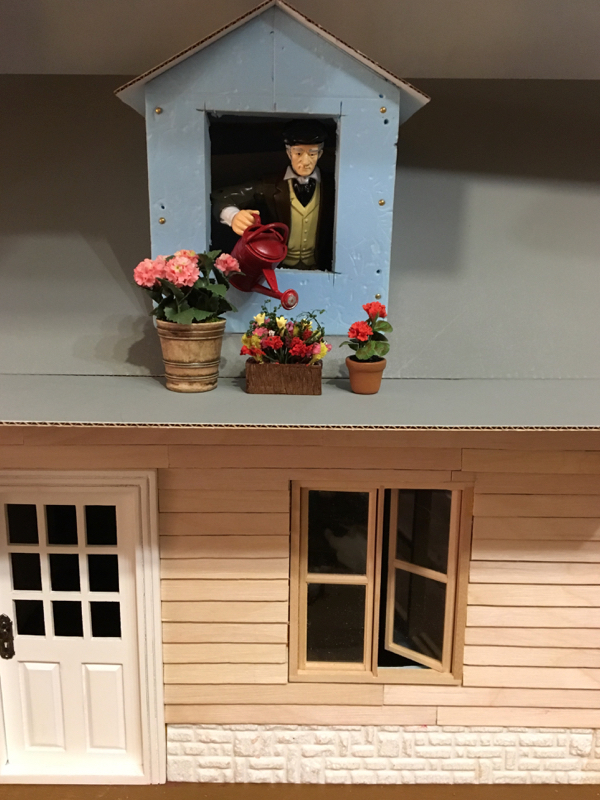 Some update on the dormer and the coffee stall. Toeffelholm wrote: Oh yes, Theodor. I haven't seen him for some time, but I think we need to have a closer look to the cake table at Rosalie's coffee stall. Human-Size Penguin Fossils Discovered Scientists believe the 55-million-year old bird would have been the size of a man. A fiddle yard behind a warehouse front. Will be served by a separate short warehouse Loco with a servo driven automatic coupling for better shunting comfort. Controlled with DelTang of course. 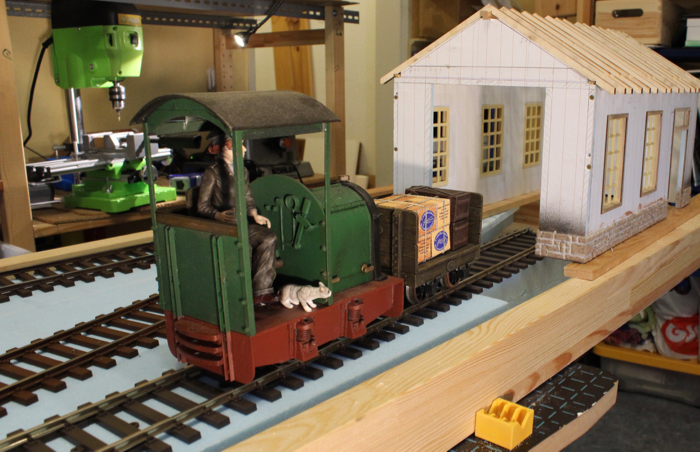 The test setup for the warehouse loco. The single cell LiPo gives sufficient speed and smooth running, together with a coreless gear motor. 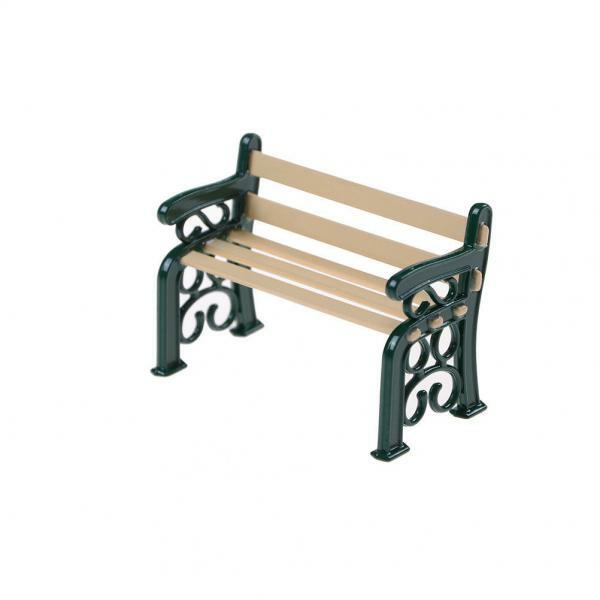 I saw this 1:12 cast-iron bench on eBay. Thought you might like it & it could be good for station platforms etc. etc. Have you seen these before ? yes I know this bench from my favorite Dollhouse supply and I think I have it still somewhere in one of my boxes, but the design is not really satisfying for me. But I have very nice brass bench parts from Si Harris at Modelearth, which are still waiting to be built. Intended for for a rail bus project. I have spent much time in planing and thinking about train operation, which wagons to use, transported goods and so on. I think I'm going to start a new thread the next weeks about my 7/8th Toeffelholm layout modeling.